Inkie, the king pin of the UK graffiti scene for the last 25 years, is putting on a special show this Christmas featuring original art works, canvases, prints, toys, sculptures, T-shirts and books from Europe’s finest artists. The Flying Eye Pop Up Shop is coming to Cork Street in Mayfair, London next week for you to pick up an impressive festive present or two. 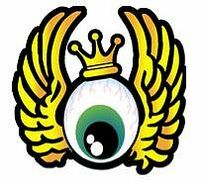 This, the first Flying Eyeball Production, promises to be the strongest visual feast from any European Urban Art Exhibition this season. From Wednesday, December 9th to Sunday, December 12th, 27 Cork Street will open its doors to the public to snap up some one-of-a kind, quirky Christmas gifts such as 24 carat gold leaf prints from Inkie and 28-colour screen-prints from drum and bass legend Goldie. Other goodies will come in the form of unique sculptures and toys from Shoe, Inkie, Eine, Mysterious Al, Sickboy, Insa, Zeus, Hush, Mau Mau, Kid Acne, Steff Plaetz, Chu, Shok 1, RYCA, David Walker, China Mike, Part2ism, Ben Allen, Andy Council, Pure Evil, Shazer, George Morton Clark, Milk, Dora and Don. Snap up some one-of-a kind, quirky Christmas gifts. Heralding from the infamous Bristol School of Graffiti, Inkie has been identified as one of the leading UK urban artists alongside Banksy, Nick Walker and Massive Attack’s 3D. A dominant presence for more than two decades on the international graffiti scene, Inkie’s trademark Ink Nouveau ladies and striking wildstyles draw from diverse inspiration ranging from Art Nouveau, Ancient Architecture, Natural forms and Islamic Geometry. Don’t miss this opportunity to pick up this original art or just see what these artists have been working on. The Flying Eye Pop Up Shop and Exhibition will be open from 10am to 8pm from Wednesday, December 9th to Sunday, December 12th at 27 Cork Street, Mayfair in London.